IMPORTANT: If you are updating existing products instead of creating new products, please read this article. 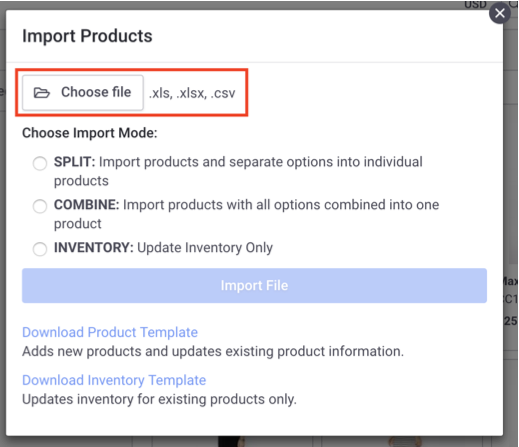 2) Click on the "+ Product" icon dropdown and select "Import Products"
3) If you are creating products for the first time, we recommend using our Product Import Template to understand how the file should be organized. 4) Once you have a file ready to upload, click "Choose file" and select the spreadsheet file from your computer. 6) Once the file has been uploaded, you will be presented with a report of the changes made.